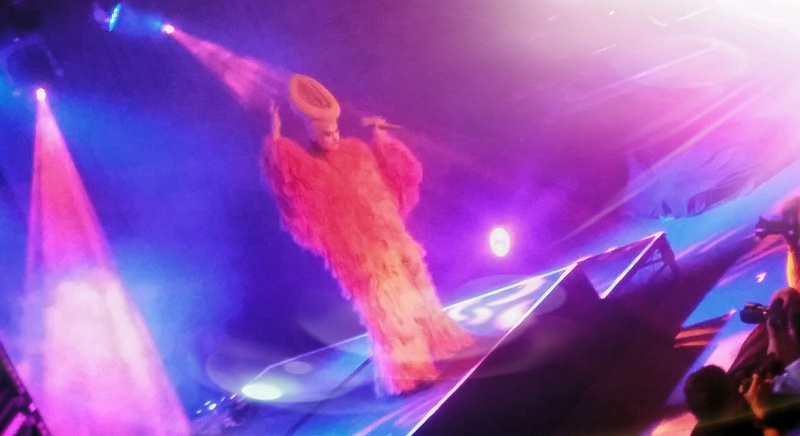 Peaches shows are somewhat of an orchestrated parallel universe – an equal opportunity, body positive, shame-free and deliberately absurd cosmos with gender-bending pan-sexuality in all its variations at its centre. Despite the focus on sexuality and an abundance of suggestive poses, titillation is not the point of the exercise. The point of the Berlin-based Canadian’s transgressive art is subversion. Depending on the context also provocation. When it comes to live incarnations in front of her faithful disciples, the point is celebration. Peaches' mission is to push boundaries, thereby playing with traditional notions of gender role representation and consciously blurring the distinction between male and female stereotypes. Accentuated by a multitude of costume changes and flanked by a dancing, submissive couple, Peaches is essentially a fun one-woman show pervaded by DIY spirit. Anthemic electro pop and sexually explicit lyrics is the skeleton. There is a punk attitude and a low-fi, minimalist approach executed with executed with surgical precision with maximum impact. There is energy and frenzied fun. Peaches is an accomplished, charismatic singer with an extensive vocal range. The quality of her delivery is flawless, no matter if she is being carried by her followers as she sings and prances into the audience inside an inflatable condom, showering the audience with sparkling wine, chanting choruses in intricate yoga poses or runs to the back for a quick costume change while she operates the samplers to create a seamless transition into the next track. Peaches is authentic, seeing her backing herself and watching her modus operandi is an empowering experience in itself. As part of the upcoming MONA MOFO Festival in Hobart, Peaches will be performing Peaches Christ Superstar in January 2017 – singing all the parts of the rock opera herself and accompanied only by piano. A new lesson from the teaches of Peaches to look forward to.